The U209-000-R USB-to-Serial Adapter Cable allows you to connect a 9-pin RS-232 serial device to a computer or laptop with a USB Type-A port. It works with modems, digital cameras, PDAs, ISDN terminals and other devices with a serial port. The U209-000-R supports data transfer speeds up to 230 Kbpsâ€”twice as fast as a built-in serial port. No external power is required, and the compact 1.52 m (5-ft.) cable tucks away conveniently in your backpack or laptop bag for easy travelling. Doubled-shielded design with gold-plated contacts, tinned copper braid and aluminum Mylar foil shield eliminates crosstalk and reduces EMI/RFI interference. Compatible with Windows 2000, XP, Server 2003, Vista, 7, Server 2008, 8, 8.1, Server 2012, and 10; Mac OS X 10.6 through 10.10; and Linux Redhat 7.3, 8.0 and 9.0. 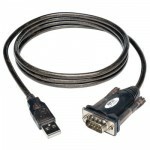 Also works with Android tablets and smartphones with the addition of a USB Host Mode (OTG) cable. - Compatible with Android Devices (Tablets with USB Host Mode (OTG) support and Android OS version 3.2 and above. Android Devices will require a USB Host Mode (OTG) cable (such as Tripp Lite's U052-06N) to connect the U209-000-R to the device.